With winter approaching, some of the most vulnerable in our society — children — could use a little help to stay warm. 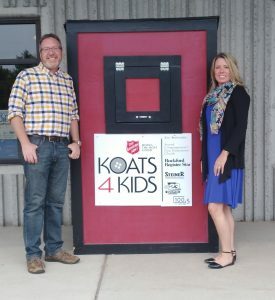 For the 17th year, Steiner has partnered with the Salvation Army for its annual Koats4Kids drive. 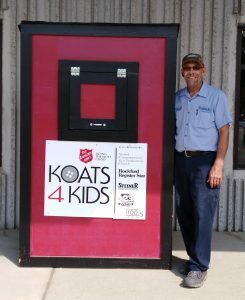 The drive helps collect and distribute cold weather clothing to the less fortunate children in Rockford, IL. and surrounding areas. Collection barrels will be located at all Steiner branches starting on September 18, 2018. Donated items must be in good wearable condition, clean, and not have any holes or stains. Adult sizes are also appreciated as many kids can wear them. All barrels will be collected on October 18th, so if you wish to donate, don’t delay! We thank everyone who contributed in the past to this great cause and look forward to once again help children in need this winter season. May is Huntington’s Disease Awareness month, and it is the mission of the Huntington’s Disease Society of America to spread awareness and raise funds with hope to discovering a cure. Huntington’s Disease (HD) has been called the “quintessential family disease” because every child of a parent with HD has a 50 percent chance of carrying the faulty, deadly gene. 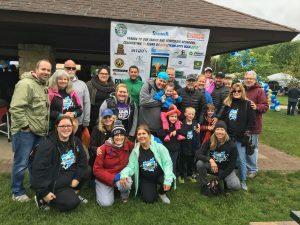 On May 20, the Illinois chapter of the Huntington’s Disease Society of America (HDSA) celebrated the 14th Annual Illinois Chapter Team Hope Walk. The event, held at the Grand Pavilion on the “Riverwalk” in downtown Naperville, gathered families and friends to support each other and raise funds. For the 2nd consecutive year, Steiner Electric was a corporate sponsor. Huntington’s Disease is a fatal genetic disorder that causes the progressive breakdown of nerve cells in the brain. Symptoms usually appear between ages 30 to 50, and can worsen over a 10 to 25-year period. HD causes a lessening in a person’s physical and mental abilities during the prime years to work. Approximately 30,000 Americans are symptomatic of the disease, and more than 200,000 others are at-risk of inheriting a gene that over time can mutate and trigger HD symptoms. Within many families, multiple generations have inherited this expanded gene. According to the HDSA, those at risk of inheriting HD can take a test to find out if they’re carrying the faulty gene. Symptoms of HD varies from person to person, even within the same family. The progression of the disease can be roughly divided. Donations to the HDSA advocacy group supports research into new therapies, provides services and referrals to HD families and individuals trying to cope with the effects of the disease, and expands educational programs and develops informational materials to bring great awareness and further education about HD into three stages. In the early stage, HD usually includes subtle changes in coordination. In the middle stage, movement disorder becomes more pronounced, and in the late stage, the person with HD is dependent on others for their care as their brain cells decrease. To learn more about HD, and the work of the Huntington’s Disease Society of America, visit www.hdsa.org or phone (800) 345-HDSA.